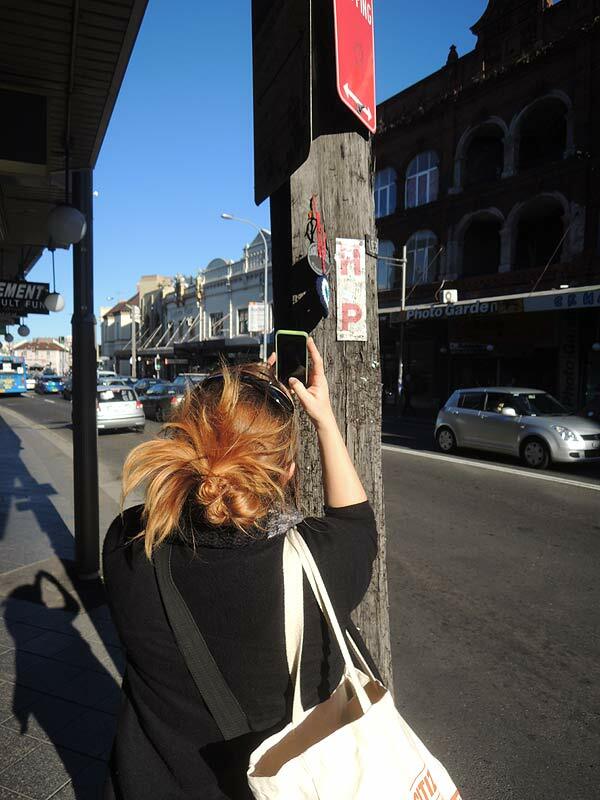 Yesterday I was in Sydney and took the opportunity to install a new work, Lucky Street, down one of my favourite streets – King St. in Newtown. Lucky Street was inspired by a gift from a friend, a handmade bracelet with 3 Evil Eye beads on it. My friend had been in Turkey for a month and hand come back with the beads to make into jewellery. You can read about that gift here. After she gave it to me, I got obsessed with this ancient symbol, and crocheted a rather large number of them. I haven’t had the right place to install them since I made them, so they’ve been piled up on my bookshelf waiting patiently for the right time, the right day and the right place. Yesterday was all of those things. 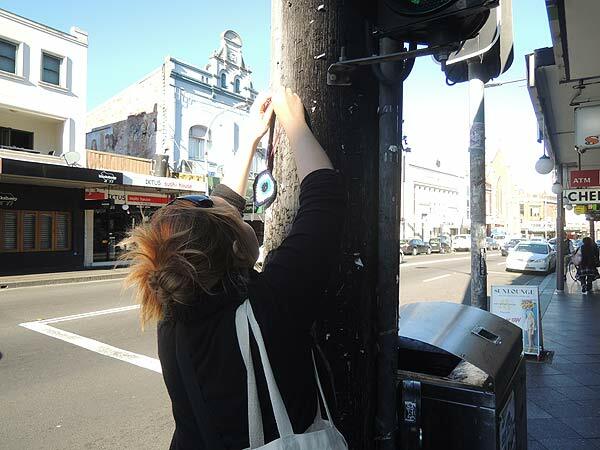 We had a little free time before heading back home so we went down King St for breakfast, to poke around the giant second hand book store and to install a few Lucky Street pieces. The first task is to hang them up. I always envisioned this work to be installed on these type of poles – the thick wooden street poles covered in rusty staples of posters long gone. I think they’re a really interesting texture as well as being useful for tying things too. Most were installed tied via a bow so that whoever wanted to take it could easily, without breaking the tie or the Nazar. The next task of any install is to photograph it. I photograph every piece of each installation, usually just with my phone, to upload to the web and so I have a record of the work produced. And then the task is to walk away. 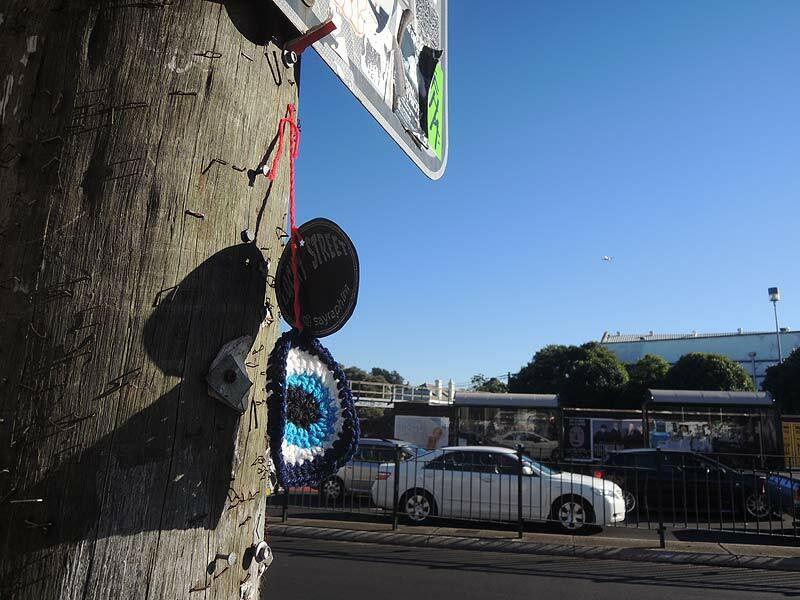 The install is complete and I never hang around to watch what happens, I release them into the urban wilds and go. And hope they help to make someone’s day, or in this case, bring someone good luck. Lucky Street can be viewed in it’s entirety here. Love in the installation and the sentiment!